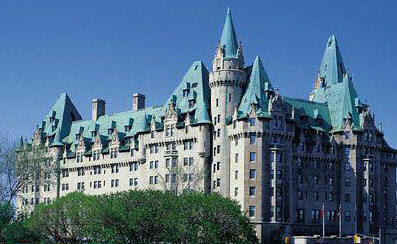 Yesterday was the Vintage Clothing Sale at the Chateau Laurier Hotel in downtown Ottawa, Ontario. The sale is once a year in this castle-like hotel. Each vendor has 150 square feet of space (about 10 feet by 15 feet) so it is quite a large area to fill. I learned a lot about what sells and what doesn't locally. 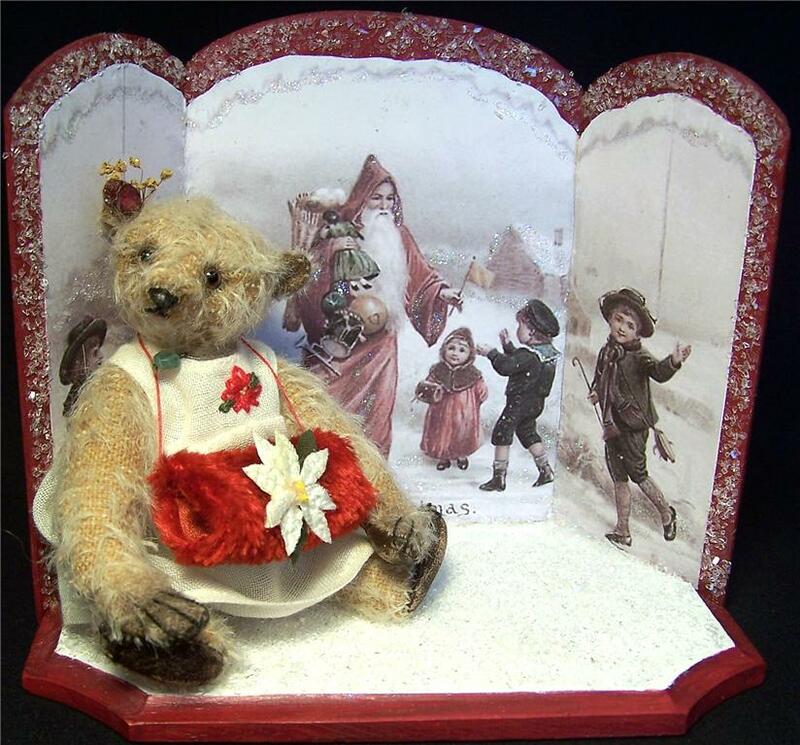 Most of my vintage sales are online so it is good to keep a pulse on the local market too. I did well at the sale, but was still surprised by what did not sell. Not a single purse sold. I don't really understand why. I did reduce the price when asked, so I don't think that cost was the issue. Any thoughts? Vintage hats are very popular with the University and College crowd. Gloves and scarves were also a big hit. I pretty much sold out of these. 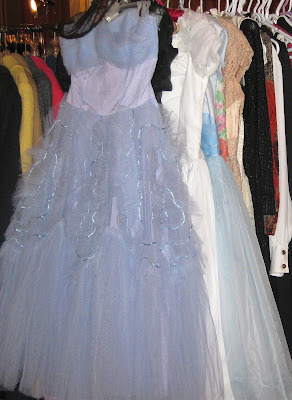 Vintage 1950s Prom Dresses are back in style . . . and you need to be a graduating grade 8 girl to fit into most of the size 0 to size 2 gowns, LOL. They were certainly small in the 50s. Luckily for me there were several girls and their moms at the sale doing some early shopping for the June Prom. And the real test of the day . 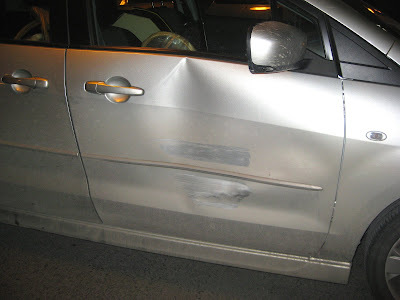 . . was not losing my cool when a 22 year old male backed into my parked car in the loading area of the underground garage at 7:15am on the morning of the show. Setup was between 7:00 and 9:00am. Just what a gal needs to begin her first big show. . . . yikes. He really wasn't going fast at all . . . just backing up . . . but look at the size of that dent! I think cars are made of tinfoil these days. Insurance has said I will not have to pay a thing, as my car was parked at the time. Hopefully my vehicle will be as good as new in a few days. I can certainly say my first show started with a BANG, LOL. I love your vintage clothing! I used to sell it, "back in the day." It's fun to see the pretty dresses and accessories again. That's odd that you were able to sell hats but not purses. In this era of suitcase-size pocketbooks, do you think the vintage purses are just too small for most women? They are lovely, though. Little jewels. Oh Karen...your poor car! Luckily no one was hurt! I am so happy that the show was a success. I know how much you were looking forward to it...interesting how things sell...the stuff you think you need lots of...and then the things you weren't counting on...sell!! Go figure! You have such beautiful items...they will all sell soon. Love all your vintage goodies! Oh Karen you poor dear starting off your day like that, but glad that the Insurance is paying out. What a gorgeous Castle and you would feel like a Princess for the day! I love all your vintage treasures - those little purses and the gorgeous gowns. Karen thank you so much for allowing me to tag along on your big day. I had such a wonderful time, I know I wasn't much help to busy shopping for myself :). I'm so glad your car will be taken care of, not a great way to start of an already stressful day. You where a real trooper though, and I'm sure some time down the road you will laugh about the whole thing. I'm happy that the show was a success for you I know how hard you worked and it, everything looked amazing as I knew it would. And with such a great sales day this means you can keep hunting for more goodies for next year. Looks like your day was a success, even with such a bad start. Glad your car will be fixed and as Deb said in her post, something you can laugh about down the road. Congrats on all your sales! Those purses are so nice! I can't believe they weren't sold - bejeweled clutches are so in right now. I would have bought one if I had been there. 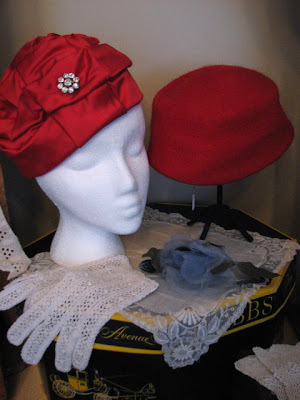 Your items are the intriguing pieces and some of them (hats especially) remind me of a my grandmother's hats---i still have some from when she was a mere 18 years old. Ouch....that dent is "Not Cool." Boooooyyyyy do I wish I could've been there!!! Sorry your day started with a bang, what a bummer. Hope you had good sales! Your friend Deb is a gem indeed. So sweet of her to take in the kittens too, poor little things. 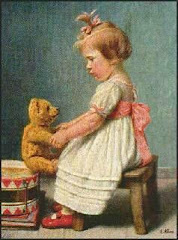 I had a similar story on my blog, Little Orphan Annie. I hope she's able to find homes for them quickly, if she isn't able to keep them all. I think the style of purses are large. I am different, I am always hunting for clutch purses to use with my wardrobe. Love your style. I love your blog, just wonderful photo's. I love old hats and purses. I have my mother's brown alligator hand bag and shoes from 1961, they are in great condition. I also have several of her hats from the 1950's. I love china, and any blue and white pattern china or tea pots, etc. Quilts are such a great homey comfort, I have 2 that are in need of repair, my grandmother made them. I love all your vintage treasures. Vintage is quit 'hot' in Belgium too. Congratulations on being a hit with the Blog. 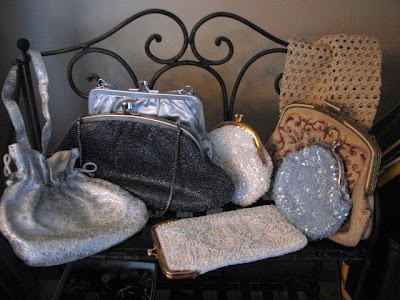 I too collect vintage purses though more for those nights out. Sequins and pearls, mini gems but o they sparkle :) I shall return ! What an amazing hotel / castle, have never seen anything like that before (appart from a real castle in the UK). Nice blog, keep up the good work! I love the hats and dress!!!! 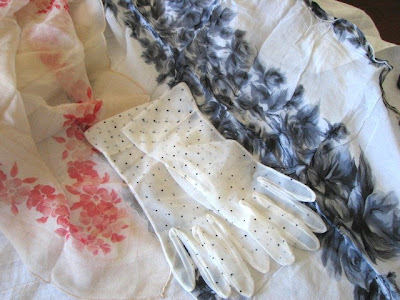 I really like the vintage gloves. I hope they are coming back into style. i love your blog , its intrasting with great photos that you post on reportag.